polish fixation: Dr's Remedy Fall Fever! Hope everyone is having a good week so far! We are halfway to the weekend now! Today I have more from Dr's Remedy to share with you. A couple of months ago I reviewed their summer collection and provided some information about the company, so if you are still unfamiliar with them Click Here to go read what I had to say about them last time. Their Fall 2011 set includes three gorgeous colors: Balance Brick, Defense Deep Red, and Noble Navy. Balance Brick is described as "A modern maroon with body and balance. This color was almost opaque in 1 coat but it was pretty uneven in some spots so I had to even it out with a second coat. The formula was really nice to work with though. 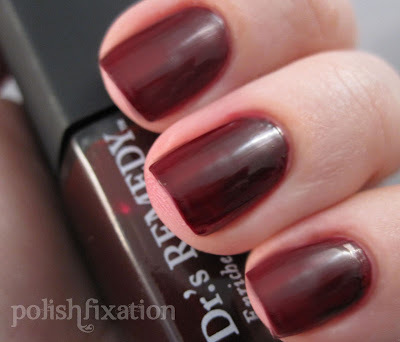 Defense Deep Red is described as "A rich bordeaux with a mystifying matte finish". This one was another that would have been opaque in 1 coat except for a few streaks I had to clean up with a second coat. This isn't as matte as I thought it would be, but you can definitely see that it doesn't have a super high shine. I really like the color of this one. Many dark reds that I've tried before usually wind up looking almost black, but this is really the perfect shade of vampy dark red. No complaints here. Noble Navy is described as "sea-at-dusk shade that reflects light and brings dimension to tips and toes alike". I love this color blue! I think I am a sucker for dark blues because so few really good ones exist! It's usually a very difficult color to master because there's a fine line between dark blue and nearly black, which this color does not cross, but many very dark navy blues tend to do. This polish can easily be a 1-coater but I did two. Definitely my favorite of the collection! What do you think of these Fall shades? 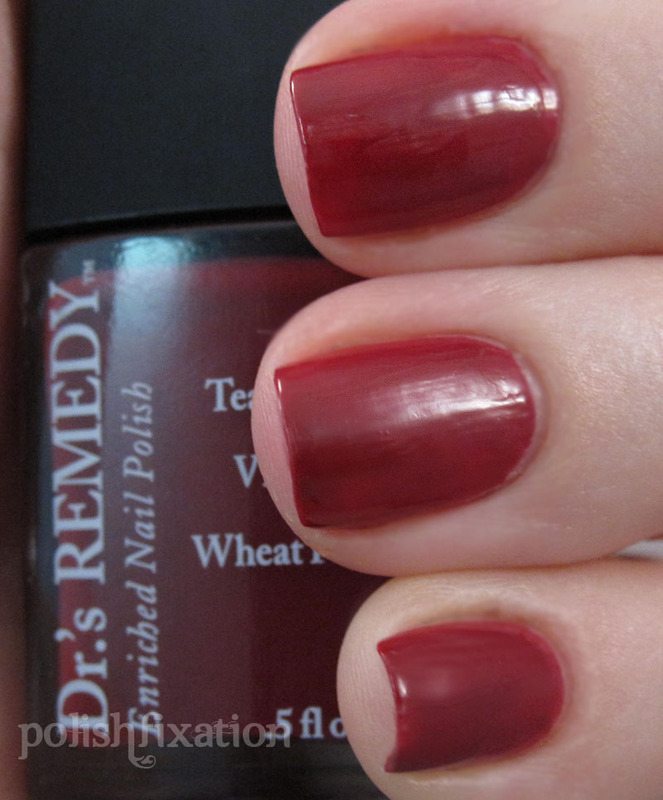 Dr's Remedy nail polishes can be purchased online for $17 each. Visit their website for more details and special promotions/pricing.